Mashable’s list of “24 Must-Read Books for Summer 2014” contains everything from full-length novels to short stories and compelling non-fiction. The list offers beach fun readings such as Emma Straub’s “The Vacationers”, but also in-depth looks at the post-recession economy in Michael Lewis’ “Flash Boys”. Alternatively, take a look at Buzzfeed’s list of 22 books that you need to read this summer. There number one is “The Lover” by Marguerite Duras, a quick read (little over 100 pages),that tells the true story of her teenage years as a French girl in Vietnam, where she met and proceeded to have a tumultuous affair with an older and wealthy Chinese man. 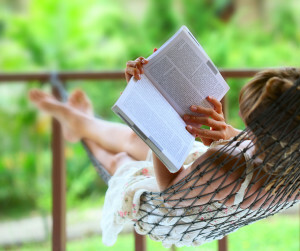 If you want to use your vacation to improve your leadership skills, Inc. magazine has the right book recommendations for you. The magazine compiled six books, which according to them, will help you improve the above mentioned skills. For example “Imagine: How Creativity Works” by Jonah Lehrer deals with how to be more creative, more imaginative, and more productive. So if you struggle with new ideas and changing your perspectives, this is your book. Inc. magazine also has got the right books if you want to advance your marketing knowledge. In the list “Top 10 Marketing Books of All Time” you find 10 books about marketing that should be in every business library.